The northern long-eared owl (Asio otus) belongs to the family of owlets and owls, the Strigidae. The northern long-eared owl species is distributed in Europe, western, central and eastern Asia, North America, northern Africa and northern Indian subcontinent. These owl species have erect blackish ear-tufts. These owls are polytypic species. The northern long-eared owl (Asio otus) is a medium sized owl, measuring 35 to 40 cm in length and weighing 200 to 400 grams. The overall plumage is brown. There is buff, dark brown and white streaking allover the body. The head is large and rounded. There are conspicuous dark ear tufts. The facial disc is conspicuous, buff in color and bordered by a thin white line. The bill is curved and gray in color. The irises are bright yellow. The legs are covered with buff yellow feathers. The call of these owl species is a deep hooting sound. The northern long-eared owl species is distributed in North America, Europe, western, central and eastern Asia, Mediterranean region, north Africa, northern Indian subcontinent, China, Japan, North Korea and South Korea. In India, these long-eared owl species are distributed in the states of Jammu and Kashmir, Himachal Pradesh, Uttarakhand, Sikkim, north West Bengal and Assam. The northern long-eared owl nominate subspecies A. o. otus is distributed in Europe, western, central and eastern Asia, Mediterranean region, north Africa, northern Indian subcontinent, China, Japan, North Korea and South Korea. The owl subspecies A. o. wilsonianus and A. o. tuftsi are distributed in North America. The subspecies A. o. canariensis is distributed in Canary Islands. These northern long-eared owl species have moderate forest dependence. They normally occur in altitudes from 0 to 2700 meters. The artificial ecosystems and habitats of these species include plantations and degraded forests. The natural ecosystems and habitats of these owl species include tropical and subtropical moist montane forests, boreal forests, tropical and subtropical moist lowland forests, dry shrublands, boreal shrublands, temperate shrublands and wetlands. The diet of these northern long-eared owl species consists mainly of small mammals. Small mammals, birds, reptiles and fish are their primary food. They normally hunt over open country by night. 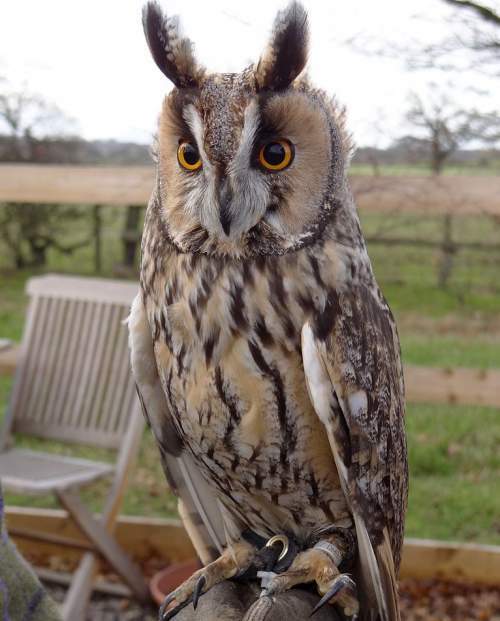 The breeding season of these northern long-eared owl species is from February to July in most of their breeding range. Sometimes a second brood is raised. These species are monogamous. The nesting sites are located on tree branches. They make use of the old stick nests of crows, ravens, magpies and hawks. The clutch contains four to six white eggs. Both the parent northern long-eared owls incubate the eggs for about 25 to 30 days. These northern long-eared owl species are partially migratory birds. The subspecies A. o. otus in north of its range in Europe and Asia is migratory and moves southwards in September for wintering in Iran, Afghanistan, Pakistan, India and Southeast China. 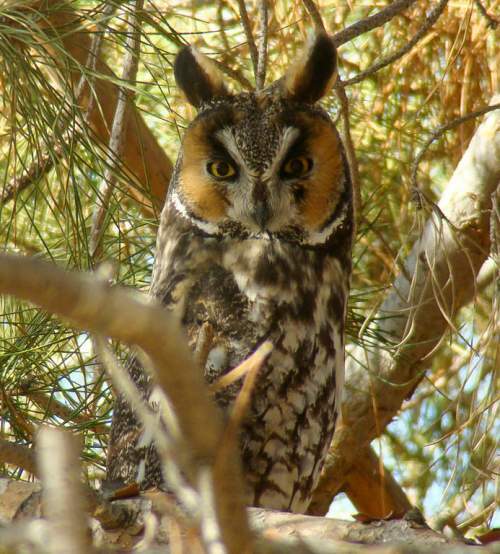 The long-eared owl subspecies A. o. tuftsi and A. o. wilsonianus are distributed in North America and migrate to southern parts of North America for wintering. The subspecies A. o. canariensis is a resident in Canary Islands. The global population size of the northern long-eared owl (Asio otus) is estimated to number about 2,180,000 to 5,540,000 mature individual birds. The overall population trend of the species is considered to be decreasing. In most of its range, this species is reported to be common to uncommon. The generation length is 7.2 years. Its distribution size is about 80,100,000 sq.km. Habitat alteration and destruction, deforestation, dearth in prey animals and capture of adults and juveniles for pet-trade are the main threats that are endangering the survival of these species. The northern long-eared owl (Asio otus) does not approach the thresholds for being Vulnerable, either under the range size criterion, or under the population trend criterion or under the population size criterion. The IUCN (International Union for Conservation of Nature) has categorized and evaluated the owl species and has listed it as of "Least Concern". The CITES (Convention on International Trade in Endangered Species of Wild Fauna and Flora) status is ‘Not Evaluated’ for the northern long-eared owl (Asio otus). The northern long-eared owl (Asio otus) is closely related to Abyssinian owl (Asio abyssinicus), Madagascar owl (Asio madagascariensis) and stygian owl (Asio stygius). 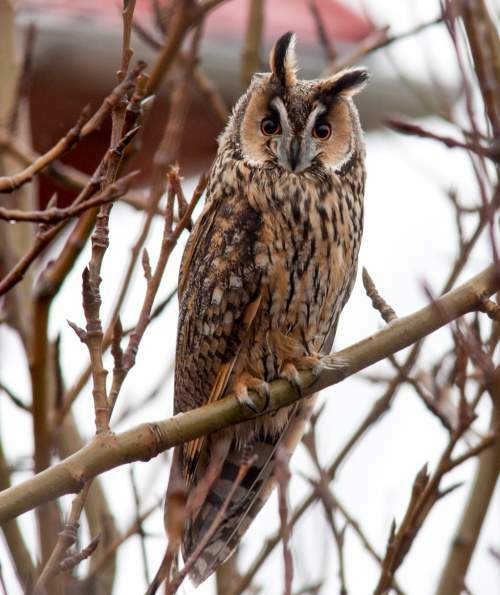 The four recognized subspecies of the northern long-eared owl (Asio otus) are: A. o. otus (Linnaeus, 1758), A. o. canariensis Madarász, 1901, A. o. tuftsi Godfrey, 1948 and A. o. wilsonianus (Lesson, 1830). Current topic in Birds of India: Northern long-eared owl - Asio otus.